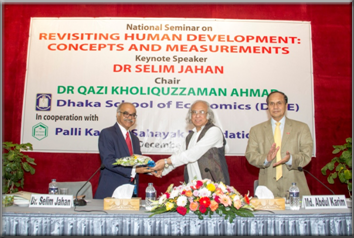 Palli Karma-Sahayak Foundation (PKSF) and Dhaka School of Economics (DScE) jointly organized a national seminar on “Revisiting Human Development: Concepts and Measurements” on Tuesday 22 December, 2015 at PKSF Auditorium. The seminar was chaired by Dr. Qazi Kholiquzzaman Ahmad, Chairman, Governing Council, DScE and Chairman, PKSF. Mr. Md. Abdul Karim, Managing Director, PKSF gave the welcome address. A keynote presentation was made by Dr. Selim Jahan, Director, Human Development Report Office, UNDP. Dr. Jahan is the lead author of the Human Development Report-2015. He explained different indicators that are taken into account to measure the progress of human development and emphasized on the need to contemplate over the destiny of the future generation to go ahead. PKSF’s officials, the students of DScE and other distinguished guests were present in this seminar.